Our ‘Good Thinking Investigates’ series uses audio and video recordings to investigate pseudoscientific ideas. Clearly it seemed our volunteers’ lives were alarmingly similar. What would happen if a fourth investigator visited a second palmist in the same booth – the daughter of the previous palmist? All four of our volunteers received several identical ‘psychic’ statements, even when seeing two different palm readers. We strongly believe these readings were largely standard, and likely to be given to many customers who visited the booth. With our volunteers receiving readings with few discernible differences, we feel customers can be misled into thinking they are getting a personalised reading. We contacted the psychic to share our investigations and our concerns, but she declined to comment. We have reported our concerns about this palm reader to Trading Standards. Special thanks go to the volunteers from the Merseyside Skeptics Society. In our last investigation, we visited a palmist in Blackpool, and were disappointed with the accuracy and the high cost of the reading that we received. Having visited our chosen palmist once, we partnered with the Merseyside Skeptics Society to find out how the palm reader would deal with clients in a genuinely serious situation. Our investigator Alice suffers from Hypermobility Syndrome (a chronic and highly-painful disability), but she responds to the palmist as she would have done prior to receiving her diagnosis. Everything Alice tells the palmist about her symptoms is true. Our investigator was told that her chronic, highly-painful disability was ‘nothing serious’ and that she would make a full recovery in a few months – and that she alone was responsible for how she felt. In fact, hypermobility is a genetic disorder which cannot be cured. Given the irresponsible health advice we received, we decided to see how our palm reader would deal with an investigator who pretended to have severe financial problems and a gambling habit. The palm reader directly encouraged a client with financial troubles to continue gambling, to expect a big win and to ‘do nothing different’. 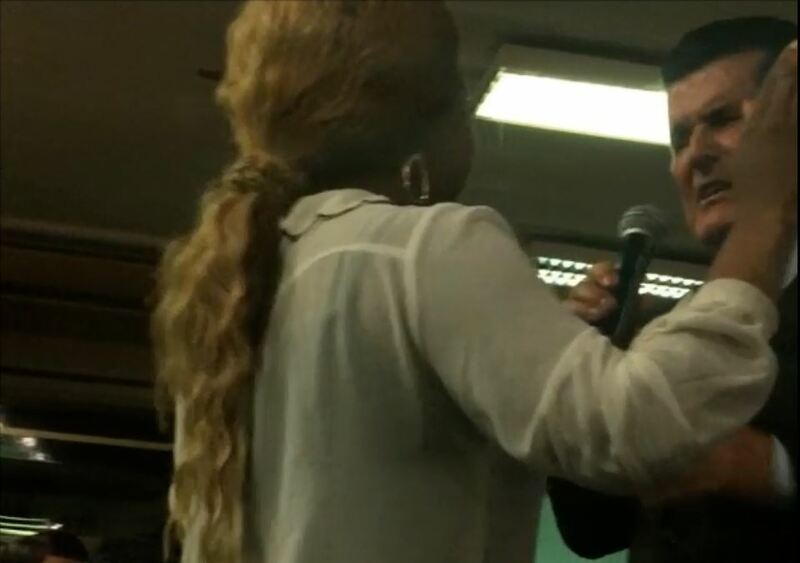 She also offered misleading information regarding serious health concerns. Find out what happened when we returned to the psychic one more time, as we reveal a shocking similarities across all of our readings in the concluding part of this Good Thinking Investigates. Follow us on twitter (@GoodThinkingSoc), to find out more about our investigations. Palm readers have operated in seaside towns across the country for many years. Many people put their trust (and hand over considerable amounts of money) to psychics – especially in times of need. We feel our investigator was pressured into paying for a more expensive reading than he was comfortable with, paying £30 for a reading which lasted just 5 minutes. Other readings on offer cost as much as £50 and even £100. The reading we received was inaccurate, vague and included 22 questions in under 5 minutes. The palmist showed no sign of the supernatural insight she claimed to be able to provide, and left us concerned that a vulnerable customer could be exploited. Find out what happened when we returned to the psychic with a customer who had serious concerns about her health, in part 2 of this Good Thinking Investigates. Other homeopathic remedies on sale include Asbestos, E. Coli, Uranium and a range of vaccines. Freeman’s currently provide homeopathic treatments to NHS Bristol and NHS Glasgow, costing tens of thousands of pounds per year. “Our assistant responded in good faith to what she believed was a genuine enquiry for general information on a homeopathic sarcode. She did not respond to symptoms, made no specific claims of effectiveness and explained that we would not counter prescribe such a remedy. She also explained, in general terms, a method of homeopathic prescribing pioneered by Rajan Sankaran and used by many doctors trained in homeopathy. “Any person may access specific remedy information online or in published literature such as a materia medica and self treat as they see fit. 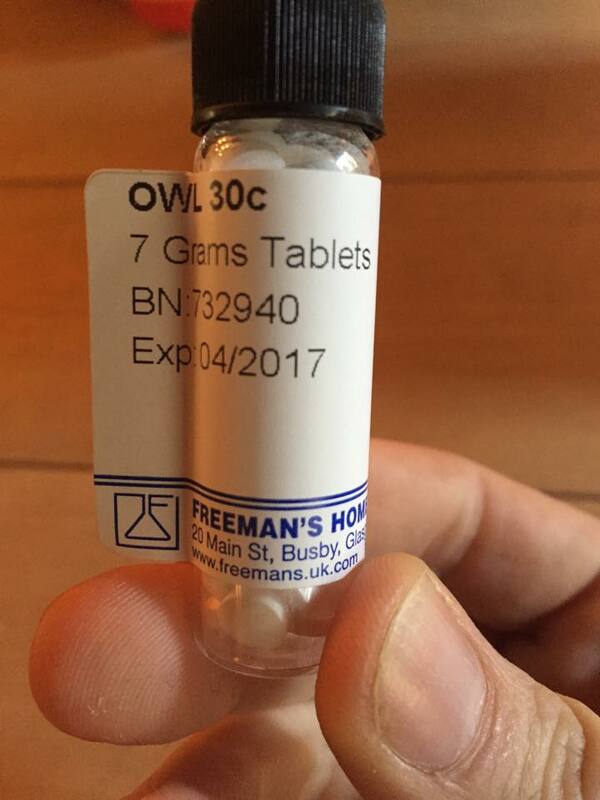 Homeopathic Owl, purchased from Freeman’s Homeopathic Pharmacy in April 2015. 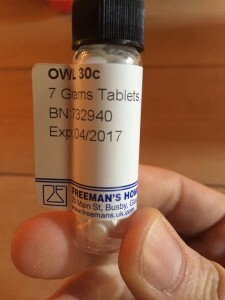 However, despite Freeman’s assurances that these unlicensed remedies would not be sold over the counter, after this recording was made we successfully bought a homeopathic owl remedy from the Freeman’s website. On that occasion, nobody asked us for a prescription or made it clear that the remedy should not be sold without one. No homeopathic remedy has ever proven to be effective for any condition. Good Thinking are campaigning to end NHS funding for homeopathic remedies. You can donate to support the campaign at justgiving.com/Good-Thinking-Society-Appeal. Many osteopaths claim to treat colic with cranial osteopathy – a therapy with no evidence of effectiveness. While this conversation has been edited for length, we have taken care to retain the meaning and intent of the original discussion. Our investigation suggests that claims to treat babies for colic appear to be rife in the osteopathy industry – despite no evidence that such treatment is anything but a waste of time and money. We have shared our findings with the General Osteopathic Council as part of formal complaints against the osteopaths we spoke to. In 2008, the British Chiropractic Association unsuccessfully sued science writer Simon Singh for highlighting that there is no reliable evidence that chiropractic can treat colic. Six years later, we wanted to find out whether chiropractors would still treat babies suffering from colic. The chiropractic clinic suggested that colic can be caused by a problematic labour, or even by having a caesarean section. We were told that the chiropractor would routinely treat babies as young as one week old, and that eight weeks old is ‘seven weeks too late’. It was also implied that vaccination is unnecessary and that chiropractic could reduce the need for medication. We have shared our findings with the General Chiropractic Council as part of a formal complaint. We will also be calling other chiropractors, to see whether they would treat colic. Sosatec Bionics Ltd sell pendants and products (“Wellbalancers”) to protect against what they claim is harmful radiation emitted by mobile phones and WiFi – claims which are highly questionable. They claim their products, which sell for £30-£44, are “made of high grade electronic silica programmed with natural botanical frequencies”. When evaluating whether a product can genuinely offer help, be wary of subjective tests and demonstrations, which can be subject to bias. Physical test such as those used by Sosatec Wellness appear to be based on Applied Kinesiology – a system used to demonstrate all manner of products and treatments. These tests are never reliable, and should not be taken as evidence of efficacy. We have many testimonials from users who are genuinely satisfied with our products. We are not in any way trying to scaremonger people into buying our product or making claims which are untrue. We clearly state in the video that the test which was demonstrated at the exhibition is subjective. We do have other evidence to support the effects of our devices which can help assist with homeostatic re-balancing and so reduce oxidative stress, including the BTE isometric strength tests ( which are measurable), and the Dynamometer hand strength tests ( which are measurable). The effects of Wi-Fi and oxidative stress are also evidenced in a report from Dr. Gerd Oberfeld, MD, Public Health Department, Salzburg, Austria, on behalf of the Austrian Medical Association, the result of which was a recommendation for Wi-Fi free school environments. These are stated on our website and were referred to in the literature available at the exhibition. We are merely pointing out that in today’s world we are constantly surrounded by electronic devices using Wi-Fi and Bluetooth connections, there are many more than just mobile phone devices. We also provide tips on how to reduce exposure to these and people can therefore make informed decisions. There were of course many sceptics about passive smoking in the early days, but eventually action has been taken by Governments to reduce the risk. At this stage in the development of usage of electronic devices, we really don’t know what effect these are having on our wellbeing, particularly in the long term. We made a full report of the claims on Sosatec Wellbalancer’s website to the ASA, who told us they were concerned by the claims and that they intend to address the problem.